The most versatile Travel Pack you can buy. And it's hand-made in the USA. 22x14x9 - More room inside than other carry-ons because the external wheels pop-off/on easily if you have to use the airport size check cage. So the wheels don't steal space from inside the case. Advertise - Send us your full-color JPEG file and we will print and apply your design at no extra charge. The CoroCase is white so you can add your own advertising designs, logos, and decals. Or have every friend you meet on your travels sign your MetroWild. Or be an artist and paint the CoroCase any way you like from camo to Cezanne. Chair - The only luggage/backpack that is also a chair to sit on! Sit down on the CoroCase lid anywhere, anytime... whether it's empty or packed full. Ultralight - The MetroWild weighs only 4 pounds (1.8 kg)... the same as two 1 liter bottles of Dasani. 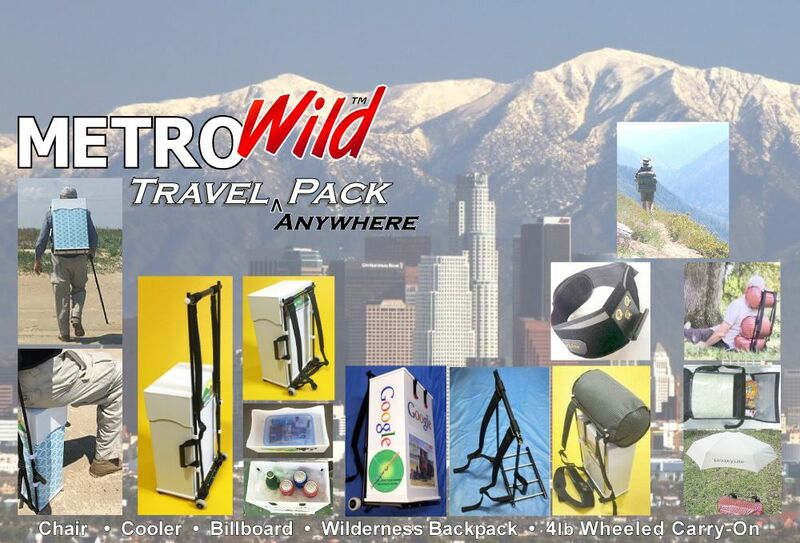 No wheeled carry-on is lighter.. AND remember, your MetroWild is also a rugged wilderness backpack. The removable CoroCase is a 30 liter capacity plastic box with a sliding lid that expands capacity to 36 liters. Waterproof - Your computer and clothes will stay dry when sitting in the rain on the luggage wagon. Or... want some cold drinks during your urban or wild travels?... fill the CoroCase with ice and sixpacks. We also sell accessory fabric Gear Cylinders that are rainproof. No pack cover needed. Frame - With the CoroCase removed, the telescoping aluminum frame becomes an ultralight dolly -- for a car seat, travel kennel, golf bag, etc. The vertical tubes can be removed from the shelf to pack it down flat. This frame design has been proven over the past 10 years to endure thousands of miles on wilderness trails with no failures. If you're walking through the airport or hotel and you need both hands free to send a text, slip the MetroWild over your shoulders like a regular backpack and keep on walking. Wild - The Frame has no waist belt permanently attached. 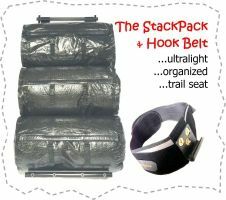 To carry more weight on long distance backpacking treks, add the Hook Belt. You can leave it around your waist all day long... perfectly adjusted. The MetroWild is super comfortable. Your back lightly touches the smooth, cool CoroCase. Totally ventilated, no sweaty pads. Fits 24 to 55 inch waists. Fits - The aluminum frame telescopes to fit any torso length and the Hook Belt will fit from 24 to 55" waists. The two shoulder straps at maximum length give you a 36" long handle and at shorter lengths make a comfortable backpack. USA - Hand made in Texas using USA made parts including Easton aluminum, Velcro® straps and 100% recyclable Coroplast. Lifetime Warranty and 30 day free trial. Click here for more technical information... or call 979-900-6280. $289.95 -- MetroWild Carry-On - Carry-on legal overall external dimensions: 22x14x9 inches. Includes the telescoping external aluminum frame that can be packed flat, adjustable shoulder straps, removable hard side waterproof CoroCase with telescoping lid, side carry handle, one 18x9" Barrel Bag, and the removeable wheel kit. Free USA shipping. for one MetroWild Carry-On (small accessories included). Want to try a PCT thru-hike? $2380 -- 4 Pack of Street Screen Frames. Free USA shipping.